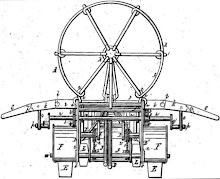 The story of Micajah Clark Dyer and his inventions, particularly his flying machine, is an amazing one that was kept alive through Dyer family oral tradition until 2004 when, thanks to the modern invention of the internet, family members were able to identify the 1874 patent and obtain a copy, proof that the machine had, in fact, been built and that sophisticated plans had been filed with the United States Patent Office," said Paris. 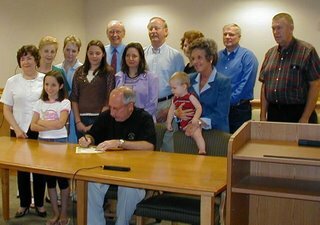 "I am very pleased to proclaim September 1, 2006 as Micajah Clark Dyer Day. 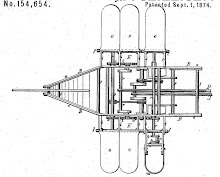 September 1, 1874 is the date Mr. Dyer received a patent for his flying machine." Paris offered a special thanks to the family and friends for "their stick-to-it-ness in finding the proof, bringing it to the consciousness of the public, having State Representative Charles Jenkins and Georgia Department of Transportation dedicate the portion of Hwy. 180 that Micajah probably traveled, and in hopefully giving Union County a place in the history books for future generations to know and appreciate."